What is Exterior Basement Waterproofing? - Waterproofing your basement by excavating around the house. What is Excavation & Exterior Basement Waterproofing? Expensive and extensive. Installing a bentonite waterproofing system on an existing house usually calls for complete excavation of the foundation. Interior drain and sump pump systems are more affordable and also more effective. Installing an exterior waterproofing system is one option for waterproofing a basement. Also referred to as “positive-side waterproofing,” this technique relies on a waterproof membrane or a waterproof coating to prevent water from entering the basement. The membrane treatment utilizes plastic sheet material and/or a thin layer of “Bentonite” clay that forms a water barrier. In terms of coatings for basement waterproofing, most exterior treatments have a thick, tar-like consistency and can be applied by brush or spray. The best time to install an exterior waterproofing system is when a house is under construction. Installing this type of system on an existing house poses a number of problems, as explained below. Expensive. To install a waterproof coating or membrane on the exterior of an existing building, it’s first necessary to fully excavate around the foundation. Skillful excavation using heavy earth-moving equipment can be very expensive. Add to this cost the expense of installing a waterproof treatment and the cost of backfilling the foundation. Damaging & disruptive. 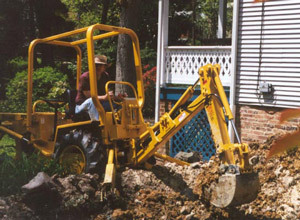 The excavation process often involves removing trees, shrubs and garden areas next to the foundation. Patios, walkways, and decks may also need to be removed. In addition to losing these valuable landscape features, access to the home may be difficult or even hazardous. Limited effectiveness. When properly installed, exterior waterproofing systems can stop most of the water leakage that typically occurs through basement walls. But these treatments do nothing to stop water from leaking into the basement along the gap between the basement floor and basement walls. Even with a well-functioning exterior waterproofing system, it’s possible to get water leaking into the basement. Clogged exterior drains. An exterior drain placed near the base of the foundation wall is an important part of any exterior waterproofing system. Unfortunately, drain lines in this location eventually become clogged with silt and plant roots. Clogged exterior drains allow groundwater to accumulate around the foundation, increasing the chance that water will leak into the basement.